Keeping healthy as an author is tough. We’re required to sit for long period of time and type, edit, and promote, all on our computer. Hands out in front, wrists bent, shoulders slumped, neck in one position for a long time — just thinking about it makes my back and neck ache. There’s probably nothing worse for us, yet this is what we have to do, right? Just this past year, I decided that if I was going to be writing as much as I had planned, I needed to do something about my health. My hands and shoulders were in constant pain and even though I was walking and going to the gym, it still wasn’t enough exercise. 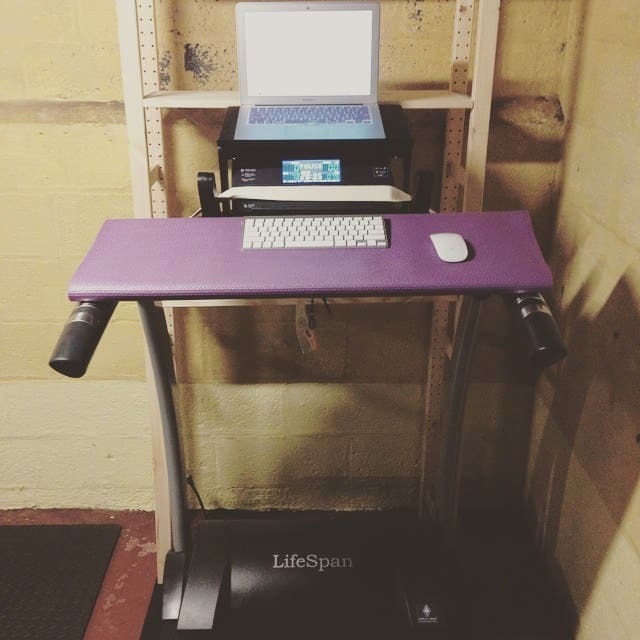 So, I did two things, the first of which was purchase a treadmill and make a treadmill desk (the second is dictation which I’ll write about again in another post soon). A couple of other authors I know have been thinking about either purchasing a dedicated treadmill desk or turning their treadmill into a treadmill desk. There are some pros and cons to both of these approaches. There are a few of these on the market. They have a special motor in it that’s designed to go at the slow pace of working and walking. It’s not bulky and has the desk already built into it. PRO: You buy it, put it together, BOOM you have your desk. CON: You can only use it for slow walking. No running. You already have a treadmill or you want a full treadmill because you also plan to run on it (or in my case, my husband runs on it). PRO: It has multiple functions, and if you already own one, then you’re saving money! CON: You have to make your own desk and it’s also possible you may burn out the motor at some point by walking slowly on it too much. So I went with the make your own option because my husband wanted to run on the treadmill too. We actually got reimbursed for some of the treadmill through our health insurance (crazy, right? ), purchased it from Amazon, and put it together in one day over a weekend. I did all the research and decided on the LifeSpan 1200i Folding Treadmill. It has everything we wanted plus some good reviews, especially reviews that said it was easy to put together, which it was. Once I had that going and set up, I went to IKEA, bought a shelving unit, and proceeded to jimmy up a desk. In the end, I also used an iCraze Adjustable Vented Laptop Table to put my computer up on the treadmill where I could see it. Then I purchased a wireless keyboard for my Mac, created a desk space with a shelf and yoga mat, and done! I made this video so you can see how it’s all put together. Okay, if you have any questions, I’m happy to answer them in the comments. If comments close on this in the future, you can use the link to the contact form at the top of the page. I’m happy to answer any questions you may have.